In the gardens of a disused cigar factory, a remarkable insect has come to life. The Cicada, part artwork, part community gathering space, was designed by Tomás Amat Estudio to resemble the body of an insect, with distinct parts representing the head, torso, and tail. Located in Alicante, Spain, the Cicada serves as a cafe, bar, restaurant and meeting place for visitors of Centro Cultural Las Cigarreras, a cultural center that now inhabits the old factory buildings. Each segment of the Cicada was created using distinct materials and geometry, to emphasize the division between each and their distinct functions. In the head portion is the kitchen, storage, and technical space. To reflect its utilitarian nature, architects Tomás Amat and Paul Belda used a metal frame and glacier white Corian. In contrast, the body is a rainbow of colorful metal bracing, and functions as a cold-weather lounge for guests. 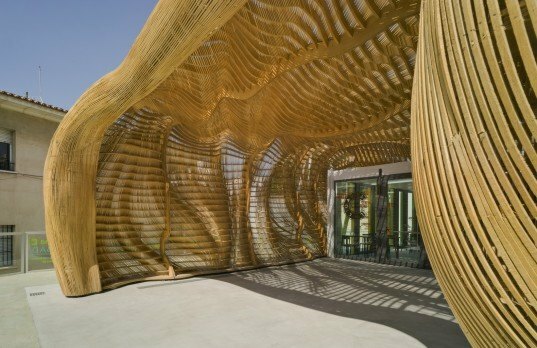 Finally, the tail is a fanciful crocheted wooden skin, which creates an entryway for the indoor spaces and provides shelter from the sun during the hot summers. Like an insect, the Cicada can adapt. The organic wooden tail, built by the artist Manolo Garcia, can be pulled back to engulf the body of the piece like a skin. This telescoping action takes the space from 127 square meters to 74 square meters inside, at the same time transforming the atmosphere and light of the interior space. “We made an adjustment to the space in which we live. An insect adapted to the environment, one conceived and designed specifically for The Cigar piece. It was not to make a normal cafe, but an exceptional work that would link with the surrounding cultural environment,” says Belda. In the head portion is the kitchen, storage, and technical space. To reflect its utilitarian nature, architects Tomás Amat and Paul Belda used a metal frame and glacier white Corian. This telescoping action takes the space from 127 square meters to 74 square meters inside, at the same time transforming the atmosphere and light of the interior space. Finally, the tail is a fanciful crocheted wooden skin, which creates an entryway for the indoor spaces and provides shelter from the sun during the hot summers. "We made an adjustment to the space in which we live. An insect adapted to the environment, one conceived and designed specifically for The Cigar piece," says architect Paul Belda. Each segment of the Cicada was created using distinct materials and geometry, to emphasize the division between each and their distinct functions. In contrast, the body is a rainbow of colorful metal bracing, and functions as a cold-weather lounge for guests. "It was not to make a normal cafe, but an exceptional work that would link with the surrounding cultural environment," says architect Paul Belda. The woven wooden tail of the Cicada was designed by Tomás Amat Estudio and built by artist Manolo Garcia. Like an insect, the Cicada can adapt. The organic wooden tail, built by the artist Manolo Garcia, can be pulled back to engulf the body of the piece like a skin.